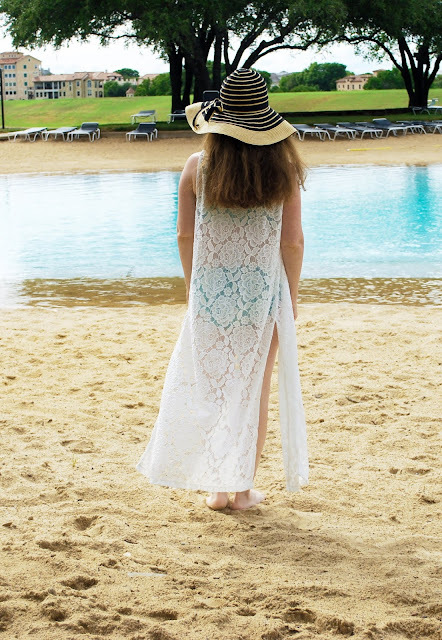 Greenstyle Creations has just released their newest pattern - the North Shore Swimsuit!! 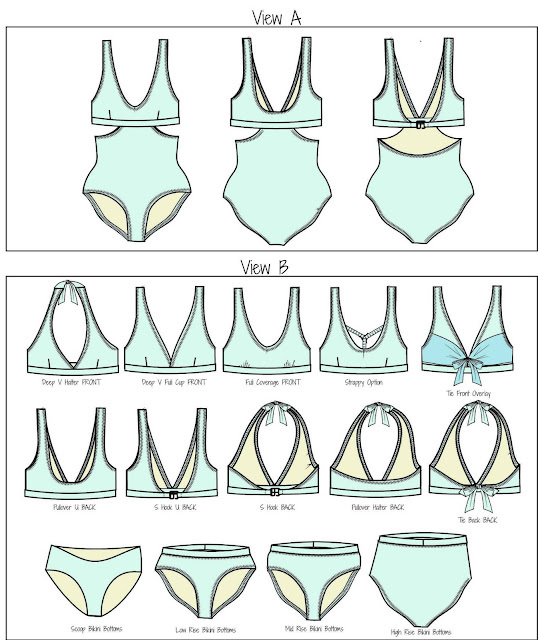 Sewing swimwear can be so fun when you have the right pattern, and I am so excited to show you this awesome swimsuit pattern! This swimsuit is PACKED with options. This is normally the part of my blogpost where I list them all, but there are so many so I will show you a graphic. You will be busy sewing swimsuits all summer long and not run out of options with this suit! The first suit I want to show you is the halter tie top with a tie at the back. I love having ties for my swim top because it makes it so easy to adjust, and I do not have to pull it over my head. This is the Deep V with the Full Cup. The Full Cup covers more of my breast than the regular Deep V. All of the swim tops in this pattern have the option to add removable cups as well. I used some from an old ready to wear swim top that no longer fit. The cups were still in great condition and fit in my top perfectly. The pink swim fabric is from Made Whimsy. I love her swim solids. I purchased this color last year and cannot remember which shade of pink I purchased, but I love this color of pink. Her swim solids are a nylon spandex with SPF protection. They have a squishier feel and are thicker than a lot of swim I have dealt with. The higher spandex content means that the swim has a tendency to roll or curl on the edges, so it is very important to baste the swim to the lining as the pattern instructs. Basting makes it very easy to work with. Her swim lining is also a great quality. Let me tell you about my swim cover up! It is a Sunday Cardigan made in the long, sleeveless view with the high slit option on the pattern. I used a stretch lace that I got in a destash, and I seriously love this cover up. It is so flowy and breezy. I had pinned several just like it on Pinterest, and the Sunday Cardigan worked perfect for my inspiration. The bottoms I am wearing are the scoop bikini bottoms. I made them with swim lining on the reverse side, but you can make them with another swim fabric on the reverse so that you have reversible bottoms. The scoop bottoms have a higher leg cutline that the regular bikini bottoms. I love how easily they are constructed. I seriously made this suit when I had the flu, and it took me one day to make. That is how easy it came together. My next suit is a Full Coverage Front with a Mid Rise Bottom. The top is a pull on top and gives me a bit more coverage for chasing kids. This was an earlier version of the pattern, but the only change made was that the front is now cut on the fold so that it doesn't break up your fabric's pattern. This is swim fabric that I bought in a destash and feels like it is a polyester base rather than nylon. It was a bit easier to work with, but it is also a little on the thinner side. This swimsuit calls for 3/8 inch and 1 inch swim elastic. I got my 3/8 inch elastic from Mandy at Made Whimsy. It is the rubber stuff that is very nice. I got my 1 inch swim elastic from Fabrictopia in the Dallas Fabric District off Perth. They had a big box of the nice rubber stuff. Some of the non-roll elastic and others that are not listed as swim elastic may work as well, just look on the package and make sure that it will hold up to salt and chlorine. These bottoms have a bit more coverage in the back and the pull on top has a U-shape in the back. This is a nice option for those who don't like halter ties on their neck. These bottoms also show a little less cheek and may be more appropriate for when we entertain guests at our pool. I am ready to swim! I hope you enjoyed reading my blog and that I have inspired you. You can purchase a copy of the North Shore Swimsuit here. The release sale price is $12, and 10% of the profits from the release sale will be donated to support the recovery efforts of those affected by the volcano in Hawaii. Isn't that awesome?!? Photo Credit: my sweet oldest daughter, Abigail, who was excited to swim when her photographer duties were over. Editing was done by my wonderful friend, Aimee Wilson.